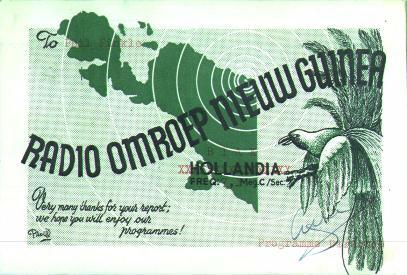 QSL card from Radio Omroep Nieuw Guinea in Biak, Netherlands New Guinea, for report of 1954 on 5.045 mHz. Power was 5000 watts. Netherlands New Guinea was part of the Dutch colony of Netherlands East Indies until 1949 when Indonesia was granted independence. After Indonesian independence, The Netherlands retained control of the western half of island of New Guinea. Netherlands New Guinea was placed under "temporary" United Nations administration on 1 October 1962. Elections were to be held to determine the future of the area but Indonesia took over administration of the area before the elections could be held and it is now known as province of Irian Jaya.